Want to get organized and wondering how to bullet journal? We’ll walk you through it step-by-step to help you get your journaling off to a great start! If you really want to be more organized but always struggle to find a planner that suits your needs and your life it might be time to switch to a bullet journal. 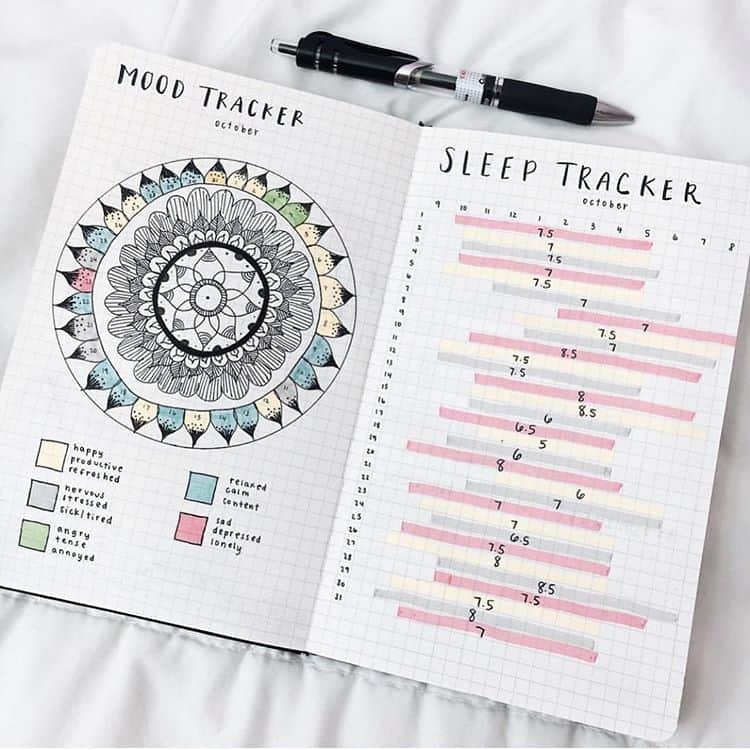 Bullet journaling is the brain child of a New York-based designer called Ryder Carroll and its a new twist on journal writing. 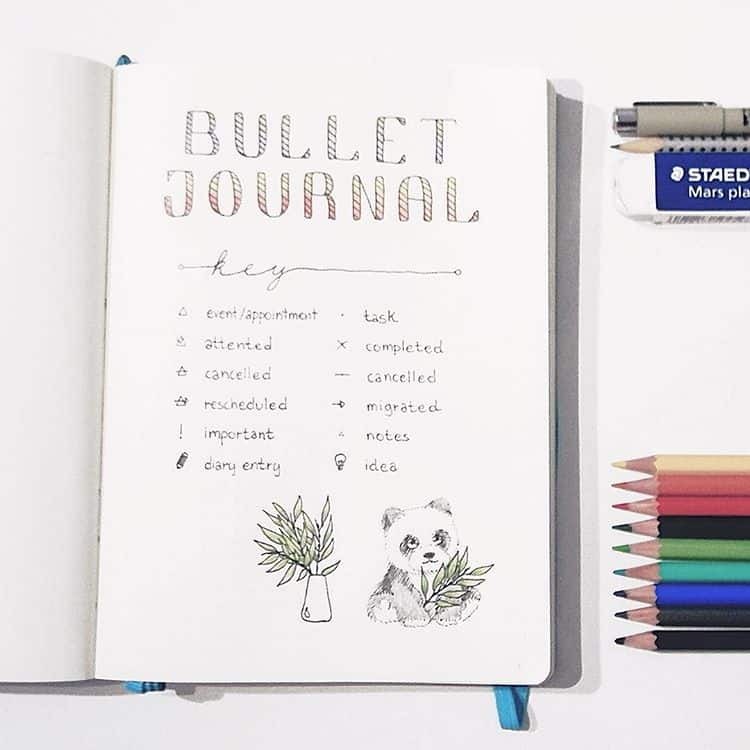 The bullet journal is ideal not just for someone who loves using a planner, but also someone who wants the benefits of a journal, but doesn’t enjoy writing. Everything is done using a rapid logging method, reducing how much writing is actually done in the journal. Bullet journaling is a lifestyle change because it changes your behavior about writing, organizing and priorities, it takes a little time to figure out how to make your bullet journal work for you, but it is totally worth the time investment! If you’ve heard about bullet journaling from a friend or seen people sharing their pages on Instagram and you’re wondering how on earth you get started you’re in the right place! Today we’re going to walk you through how to bullet journal, with everything you need to know from what bullet journaling is, how to use one effectively and how to really get the most out of your journal. What are the Benefits of Using a Bullet Journal? Who it is Good For? Place all scheduled items in your Monthly Log’s calendar page. You are probably excited to get started with your bullet journal, but it helps to first understand a little more about what it is, how it works, and how it can be useful for you. Because the more information you have to start with, the better your bullet journal will be. One thing to remember as you read through this guide is that the bullet journal is customized for YOUR needs. Every decision you make it based on what will work best for you. It’s great to get inspiration from others, and use printables of layouts that work for different sections, but don’t feel pressured to make it look or feel just like someone else’s. Quite simply… a bullet journal is a calendar, planner, and journal all rolled into one. It becomes whatever you make of it, allowing you to keep track of your past events, help you organize the current events and activities, and to make plans for the future. It gives you a number of ways to create your journal and offers an easy way to make all of your ideas and plans work in harmony. 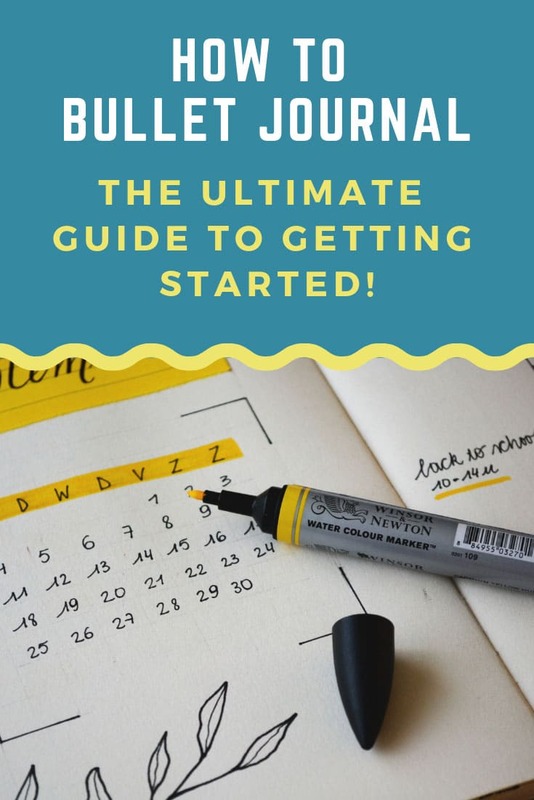 In this guide you will learn everything there is to know about a bullet journal, why it is beneficial, and how best to use it. 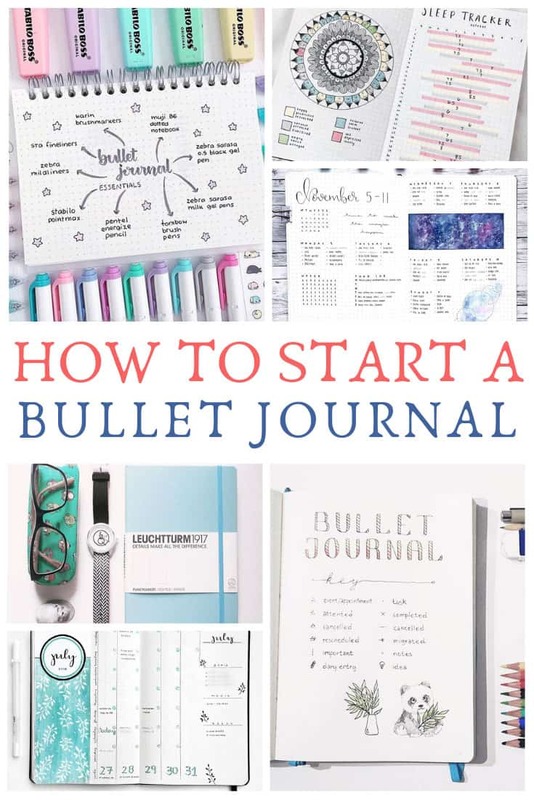 As you will see, there is a lot to learn about bullet journals, from how it is set up, to the types of collections and pages you want to include. All you need to begin is a blank journal or notebook and a pen. There are many different styles of journals, from a daily journal to a gratitude journal, and many other specific topics. With a bullet journal, you can write in it like a regular journal, but the main concept is about organizing and planning your life with it. As you know, the bullet journal works as a valuable analog asset in a digital world. It’s a way of briefly noting your thoughts, plans, events and other items of importance. It’s different than the traditional idea of a journal in that your thoughts can be jotted down on paper quickly. You’ll use just a few words and bullets (hence the name) and other symbols. No long paragraphs or flowery thoughts. Your bullet journal is there to help you plan and organize your life and activities. It will keep the to-do list for next week or next month in the same location as your schedule for tomorrow. All of your plans are located in one place, easy to find and use whenever you need it. Some people use their bullet journals as to-do lists, planners, diaries — or a bit of all of those forms of helpful self-communication. Do you have an ongoing sense of dread that you’ve got things to do but you’re not sure what and you’re falling farther and farther behind? We’re constantly bombarded with stuff to do. But what? And when? And how? Your first step, with a bullet journal, is to simply get it all down in writing so you can see what you’re up against! There are only so many hours in the day to get all of our stuff done and unfortunately a bullet journal can’t conjure up more time. But your life won’t seem so challenging if you know what you need to get done and when so that you can make better use of the hours you do have available. What you hope to accomplish might be something physical, emotional, or financial. It might be as simple as a daily to-do or shopping list or as ambitious and esoteric as a long-term dream. But once you can set your tasks or goals or dreams in front of you and start to construct a realistic approach to getting where you need to be, you’ll waste less time and get more done. Think about how good you’ll feel when you have a realistic plan of attack in front of you and it all looks doable. That’s what you get with a bullet journal entry — the sense that you’re moving logically forward. You can see on a single page how realistic it is (or isn’t) to proceed according to plan within the period of time you’ve designated. How does your day or your life look now? Don’t you feel better? You’re the president (or co-president) of your own small operation — your family. Your “employees” don’t always pitch in and can be occasionally disgruntled. Sometimes there’s even disagreement within the management team. The operating budget is never sufficient, and your forecasts of future earnings are often off. A bullet journal will help you plan your meals, schedule play dates, school activities and away games, keep on top of your finances, consider a job change and even plan vacations or a new home purchase and move. It’s easy to say that you’re going to build a garage, generate new streams of revenue for your business or plan your community’s party. But those are just big blocks of dreams. With a bullet journal you can slice that block into manageable actions. Take garage-building, for instance. Think of all that’s involved. For starters, you have to plan the size and design, estimate the costs involved and figure out where the money will come from. You need building permits and to interview and select contractors, find and price building materials and schedule time. A bullet journal lets you calmly and dispassionately figure out all that’s involved, who will do what and the steps you must chronologically take to follow your timeline. You’ll proceed with confidence, constantly updating the job in your bullet journal to correct your plans for new realities. 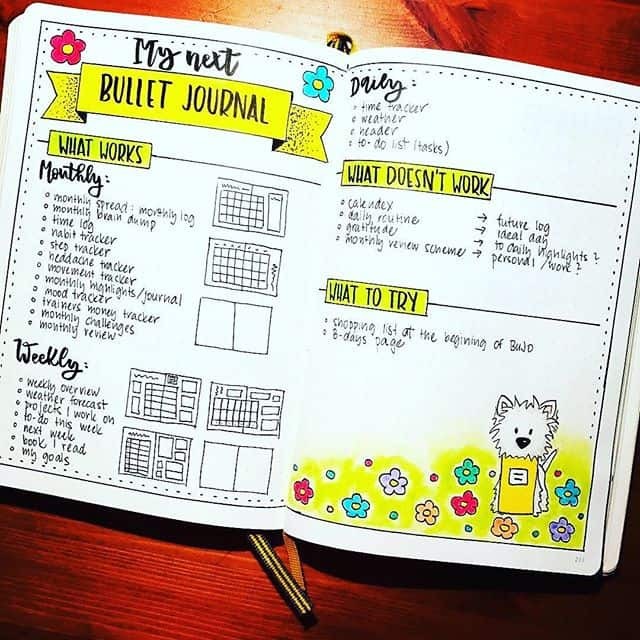 Will a bullet journal improve your life? The best way to find out is to simply start one. It is such an easy and useful productivity tool that you’ll be happy to make bullet journaling a part of your business or personal life. Fewer distractions – Less face it. You grab your phone to view your calendar or check your to-do list, and the next thing you know you’re responding to text messages or viewing funny cat memes on Facebook. Paper eliminates these kinds of distractions. Feel more connected – Many scientific studies have shown that writing out your content by hand will help you remember things better whereas technology can have a distancing effect. Writing and actually forming letters makes you feel more connected to them and the content they convey. And writing stimulates the portion of your brain that makes you sit up and pay attention. You’ve experienced the dulling effect of browsing Facebook or even watching TV right? You can do those things with half your mind engaged! Don’t feel like you have to totally abandon technology though. Technology and paper systems can complement each other. So, if you are used to managing your calendar electronically, there’s no need to stop because you can develop a system that works for you that combines your app and your paper journal. You have most likely seen these journals on a friend’s desk, online in YouTube videos, on Instagram, or even in your local bookstore. You might have opened up a notebook to see what this hype is all about and wondered why there is so much fuss being made about a journal that just has a load of geometric dots in it! But you’re here, which means you are curious to know more and whether it will work for you right? Here are they types of people that the bullet journal is perfect for. There are a lot of people who are content with making a to-do list on a daily basis and checking off their responsibilities in a monotonous manner. However, some people are overwhelmed if they can’t keep track of almost everything in their life so they are always planning for everything in advance. These people will have lists for everything, today to-do lists, tomorrow to-do lists, this month to-do lists, event lists, goal lists. If you are one of those people who is not satisfied with one list and need a better organization system in your planning life, a bullet journal would work for you. The Bullet Journal gives you the flexibility to write all the things on your mind in an organized fashion. There are no lines in the notebook, like the usual journals, just dots. And it allows you to create short lists, calendars, you name it you can put it in your journal. It will organize and separate all the things that are important to you without getting them disheveled and mixed together. The great thing about bullet journaling is that it is a technique more than a product. Sure, the plan is to fill the notebook with symbols and lists but for the most part, the bullet journal is empty and gives you enough room to design your journal in a creative fashion. You are given a blank canvas on which you can start organizing your entire life, stay on top of things, keep track of important dates and events, and most importantly get creative and have fun with! Other agendas and calendar journals are super restrictive; they have set planning box sizes and dates and use a format that you are restricted by. This can become boring and make the routine of logging and planning tiresome; making many lose interest all together. This type of journal is not restrictive in any way and allows you to add your own creative flair without losing any productivity. Many people really have a yearning to get organized, productive and aware of their daily planning. However, they have bought tons and tons of notebooks, agendas and journals and time and time again, have stopped using them after a few weeks. If the standard journals, the ones that resemble the ones we have all grown up with since receiving them in middle school, have failed you every single time, it might be time to bullet journal. You have tried the basics, now it’s time to try something totally different and take journaling into your own hands instead of following and using the strategies and books everyone else is using. The traditional journals are often too basic and might not accommodate the complications and disorganized thoughts in your head. The bullet journal allows you to address every single issue you have had with journaling and lets your deal with them in your own way, with no restrictions and only minor guidance. If you have the final say in how you organize your life in the bullet journal, you are more likely to keep up the habit of using a Journal. There are no specific requirements for a person to use a bullet journal. The main goal is organization in an individualistic manner. Anybody who has interest in this might benefit from trying a bullet journal. Even if you never had a major journaling or planning phase, the experience of trying out a bullet journal is one that is worth the try for any person of any age. It is definitely worth the time and effort you put into it. While there are definitely some situations where you might be better suited for a bullet journal than someone else, it can undoubtedly benefit everyone. From the busy working mom who is trying to get everything done, to the entrepreneur with dozens of lists and tasks to get done, you can find a way to benefit from it no matter who you are or what your current lifestyle. Before looking more closely at bullet journal set up we need to talk about rapid logging since it is critical to the success of the bullet journaling system. Traditional note-taking and journaling can be a beautiful experience for any writer. However, the more complex the entry, the more effort you must put into it to make your note-taking or journaling reality. You have another option. The option is referred to as rapid logging. This is how a bullet journal is composed. The Rapid Logging framework allows you to capture all your ideas quickly using four components: topics, page numbers, short sentences and bullets. Topics – Choose a page and write a short, descriptive title on the top left-hand corner. Bullets/Short Sentences – Use short phrases or sentences along with bullet notations to help organize your content into three categories: Tasks, Events and Notes. Tasks – Use a dot to represent actionable items, like taking your child to the dentist. Notes – Use a dash to represent notes, which can include observations, thoughts, facts and ideas. A task is any type of actionable item on your list, and an important element of rapid logging. Your task will have a dot placed in front of it. Next to the dot, you want to further separate your task according to whether it is a completed, scheduled or migrated tasks. For instance, you place an X next to the dot once the task has been completed. You place a greater than sign, or (>), next to the task if it’s being migrated. A less than sign, or (<), would be placed next to the dot if you want to show that you have scheduled the entry on your future log. An event entry is any type of date-related notation that can be logged after it happens or scheduled. For instance, sign a lease would be something you would schedule. Attended graduation would be something that you would log. Keep the event entry as brief as you can. It doesn’t matter how emotionally daunting or personal it is. Place an o next to any event entry when you are Rapid Logging. Once you have rapid logged the event, you can write about the event at length on the next pages. Notes are any notations that include your thoughts, facts and observations. The note entry can be something you want to remember, but you are not required to do anything about such as you would with an event. Place a dash in front of all sentences you categorize as notes on your page. Once you are in your second month of bullet journaling, you are ready to migrate content. Migrate means that you are transferring information from one area to another. This requires you to look at all of your previous entries. You want to take note of all the tasks marked with an X that you did not complete. Determine if the task is still relevant. If it is no longer important to you, mark out the task line. If you still need to complete it, migrate it. Next to the bullet, place the less than sign. This shows you have transferred that task to the next month. You also must place that on the Task Page of the new Monthly Log. You can do this with both tasks and events, but not notes. Place the migrated scheduled entries to your last month’s log to your current Future Log. If you cringe at this part of Rapid Logging because you hate to rewrite things, it is OK. You are supposed to not like this part of Rapid Logging. The goal is for you to pause and process each item. If the entry is not worth rewriting, it probably was not that important to you. By migrating an entry from one month to another, this instills in you what is truly worth the effort to complete. A lot of times we become aware of our habits and patterns, but we fail to separate them from our good intentions. Are you ready to jump in and start your bullet journal journey? Just hold off for a minute while we talk about the bullet journal supplies you need to get off to a good start. One thing that will be repeated more than once throughout this guide – because of its importance – is that you should personalize and customize the bullet journal for YOU. It is your journal, your planner, and your calendar. Make it work only for you and nobody else. 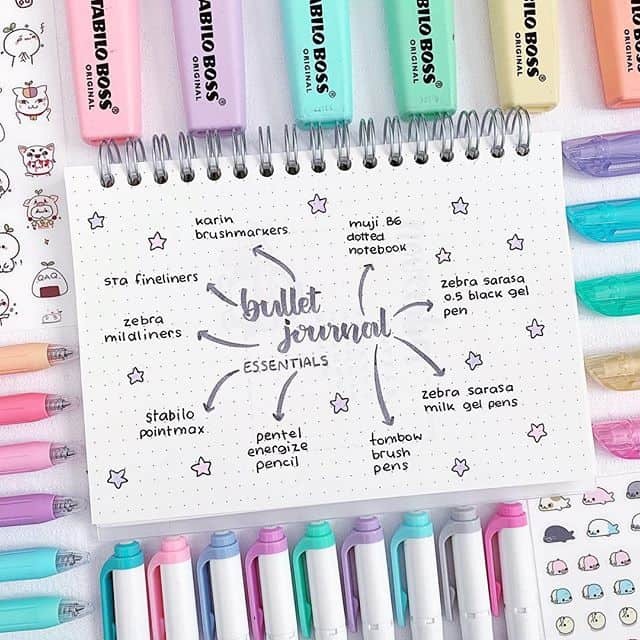 So what do you need to start your bullet journal? It is actually much simpler than you might think. Something to write with and something to write on. Of course while this could mean any kind of paper, it’s best to make sure pages are bound together securely so that it can withstand regular use and any potential travel without losing pieces or becoming easily damaged. Pens, markers or pencils can all be suitable choices for use individually or together for a layout’s design. Many bullet journal enthusiasts have their own favorite journals based on how much detail or design their pages need. The weight of a piece of paper, measured by grams per square meter (gsm), determines how durable it will be for usage and storage over time. This affects how well any writing tool works on its surface, which is important for people who use heavily pigmented pens or markers and want to avoid ghosting between the pages. For others, making sure the inks they use are water-resistant or of archival quality is a necessary factor if they intend to refer back to journals after they’re completed and stored away. 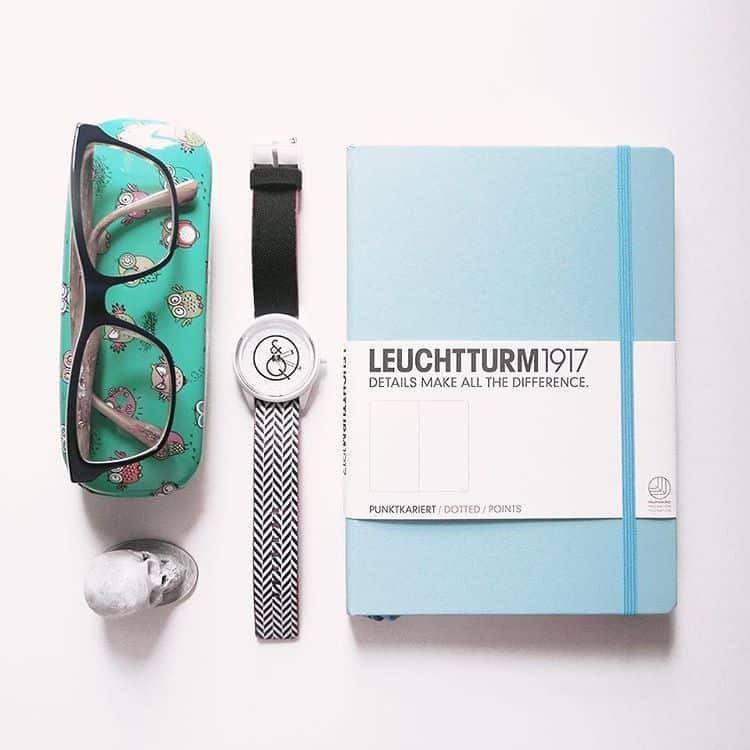 It’s is true that the bullet journaling system can work successfully regardless of what kind of notebook you use but over time people have developed a bit of a cult following for notebooks like the Leuchtturm1917 Dotted. It’s easy to see why so many journalers love this notebook because as well as the dot grid pages that lend themselves so well to the bullet journal system it also has per-numbered pages (which saves a TON of time in setup), an index table, two ribbon markers, an elastic to hold the journal closed, and a pocket in the back. It even has perforated pages so you can tear one out if you make a mistake! Oh and it comes in a range of gorgeous colors too which is perfect if you want to use one journal for your personal life and one for work or school, or if you just want to see a rainbow color of journals on your bookshelf as you complete them over the years! Here are some things you should think about before choosing a notebook to use for your bullet journal. Choosing a hard or soft cover depends on how much wear and tear the journal should be expected to endure. If you need to journal on the go and might be pulling your notebook in and out of a backpack frequently, size and weight will matter a lot. If you only need to use your journal at home you can experiment with notebooks that have larger or heavier dimensions. Depending on which monthly spreads or collections are used, a journal with a high page count may be more useful than smaller ones for those who prefer to reference past tasks and lists. More minimalist journal styles might work better with slimmer notebooks and a faster turnover between volumes. If pages will have a high degree of detail or design, then thicker paper will be an important factor to think about when picking out your journal. As you begin looking for the best notebook or journal to use for your bullet journal, you should also consider the types of pages within that journal. This is also personal preference above all else. In many cases, journals are made with one style of page formatting throughout the notebook. This can be thinly or widely spaced lines as they are most useful for pages with a lot of text-based entries. Dotted or lined grids can be better suited to stamping, stenciling or hand-lettered and drawn designs. Simple, blank pages are also common choices for more loosely arranged bullet journals that might also serve as freehand sketchbooks. Using ringed binders instead of soft or hardcover bound journals offers unique opportunities to combine many different page styles into one journal. Some manufacturers make specialized binders and sets of multi-formatted pages for just this purpose, but other styles can be adapted for use with the bullet journal method. 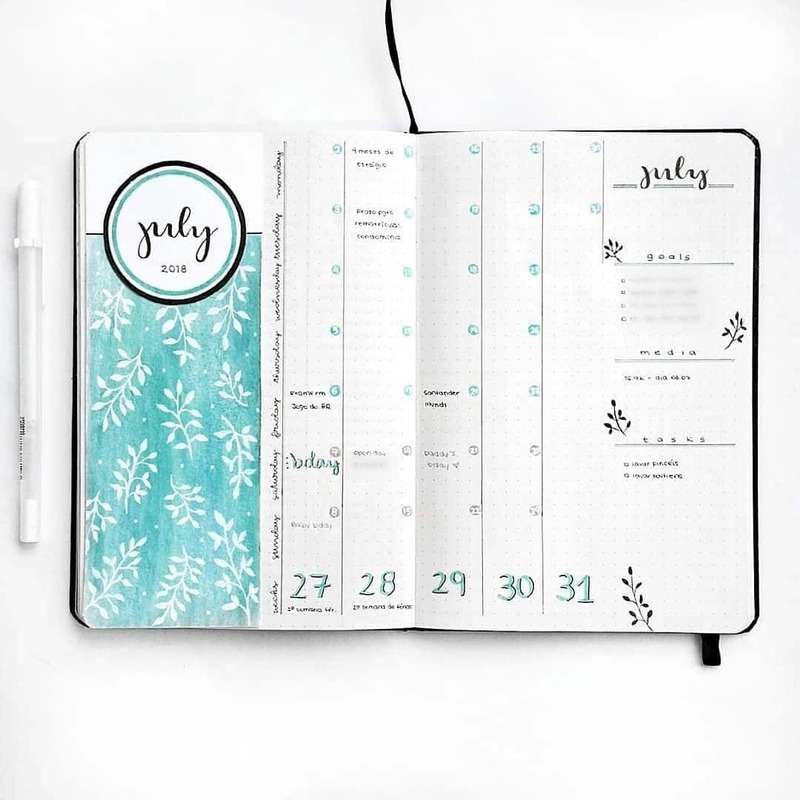 While the designer behind the bullet journaling system, Ryder Carroll, offers his own branded notebook that comes with many pre-formatted features, many other companies have also made series of journals or inserts intended for use with this method. The little things can make or break the perfect notebook for bullet journaling. Details like tabs, ribbon bookmarks or attached pen holders might not seem like major things to think about before picking out a journal, but they can wind up being an unexpected favorite feature. For heavily used journals that have loose inserts or stuffed pages, closures like snap-button tabs or elastic bands are necessary to keep it all together. 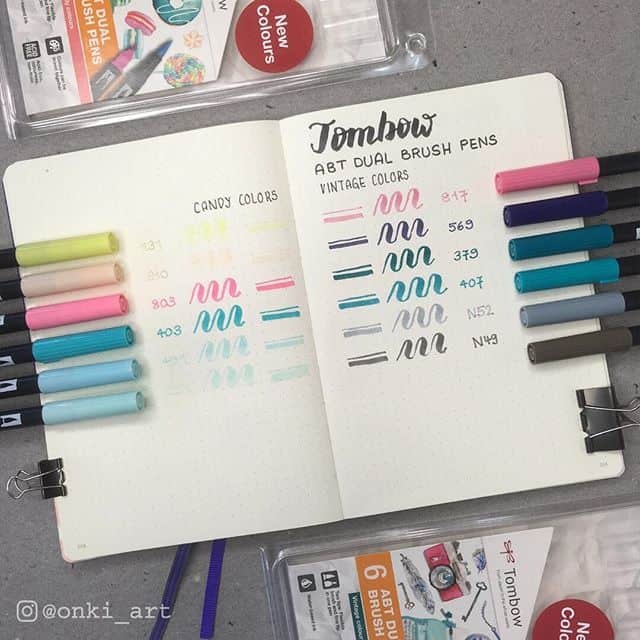 With the popularity of using stickers and scrapbooking accessories to enhance bullet journal basics, pages that can hold up to glue and tape applications are necessary for long-term use. Another factor that often gets overlooked until after a lot of use is how stiff the binding of a journal can be and how that influences frequent use. Notebooks that can’t stretch or flatten enough can be difficult to write or draw in without the use of clips or a long time spent trying to make the spine more flexible. Ultimately, choosing the perfect notebook for a bullet journal system can depend on a little trial and error with a wide range of choices and specialized preferences. However, any pen and piece of paper can kickstart a personal bullet journal and a journey towards finding what works best in the end. After you have purchased your journal or chosen a notebook to use, and gotten some of the writing utensils and other accessories, it is time to actually set up your journal. This is of course up to you, but planning ahead will save you a lot of time and headache later. The more you plan, the more organized your bullet journal will end up being. Of course, you can always add or take away pages later through migration, but here are some tips for the beginning stages of setting up the bullet journal. A bullet journal has a lot to it, but every single page and collection included is customizable for your needs. However, it does help to understand the basics first. Index, Future Log, Monthly Log, Daily Log and Collections. These modules are just different ways to help you organize and collect information and your bullet journal gives you the power to mix and match modules to suit your needs. The first page you will have in your bullet journal is the index. This works similar to an index in a book you are reading, providing a list of pages and sections in the bullet journal, and letting you know what page number each section is located on. It works in conjunction with your bullet journal sections, collections, and pages, making it easier to locate something instantly. An index allows you to keep track of exactly where a page is in your journal. Instead of flipping through the whole notebook to find “Grandma’s Secret Chocolate Cookie Recipe,” you can look at the index to quickly find the page. 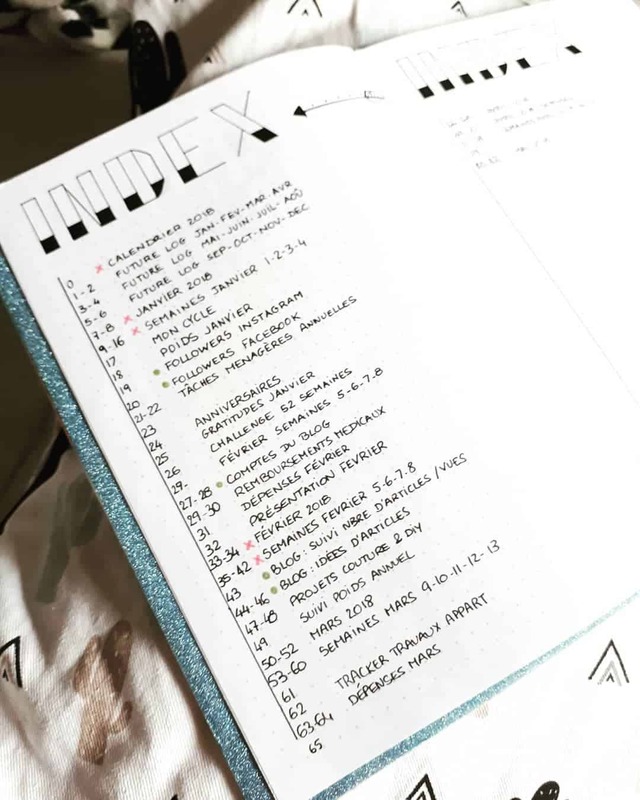 The index is more efficient when it is located on the first two open pages in your bullet journal, so it is easy to find and has adequate space within your journal to keep track of all pages and sections. You will return to these two pages often, as you list the pages you create. More importantly, you will use your Index in the future to easily find the page of any number of journal entries that you need by adding the page numbers at the bottom of the page and entering them into the Index. The worst thing an index can have is not enough space. Check the number of pages in the journal and make sure you have at least that much room in your index. If you do run out of room, just flip to the back of the book and continue it there. A bullet journal index can be linear like a book index or categorical. You can list every page in the index as it is created. If you prefer to keep your pages together with their specific categories, you can structure your index with different categories like “Projects” or “Calendars.” Each page will go under its category with the page number. Use specific names to label your pages in the index. For example, instead of saying “House Ideas,” using “Organizational Updates for the House” will be clearer and make it easier to find the page. Create your own bullet system for collections or lists that are unfinished, completed, or have been moved to another page or another journal. Bullet journals can be fun and practical ways to get organized. Instead of floating lists or a hundred journals with only three pages used, you can keep track of everything in one place. A bullet journal index allows you to keep your journal organized the way you want. We talked about Rapid Logging and how it is key to the success of your bullet journal. An important aspect of setting up your bullet journal is to choose the signifiers you will use to rapid log your entries. These are the cornerstone of a bullet journal, as they allow you to make notes in the journal without writing a lot. Writing traditional journal pages is not practical in this type of journal since there is rarely sufficient space for it. Instead, you choose symbols, known as signifiers, to represent each note you make. <3 – Use a heart signifier for anything you like or love in the bullet journal. * Use the asterisk symbol when you want to mark something important. $ – The money symbol is perfect for anything related to your budget or finances. There are many different symbols to choose from online, because people create new ones based on their needs. Look at a few to get some ideas, and then go ahead and create your own. Don’t get sidetracked with 100 different signifiers. Use simple ones like hearts, stars, boxes, etc. or use a symbol that has special meaning for special projects and memories. Not everyone feels the need to do this but when you’re starting out it’s really helpful to create a key of all of your signifiers to remind you exactly what each signifier or symbol is being used for. Putting it near the beginning of the journal, typically after the Index, makes it easy for you to reference as needed. The next part of the bullet journal is going to be your future log. This is a six or twelve month view into the future and is the place where you store appointments, events, notes for things that will happen outside of the current month. Each month you will refer to this collection and pull relevant items into your current monthly log. Each month you will set up a new monthly log in your journal. It is meant to give you insight into the month coming up, including events or birthdays, weekend plans, work or school tasks, household errands, and everything else going on in your life. The monthly log is usually split into two facing pages. The left side is your calendar page, where you can enter events and appointments next to the day of the month. The right side is your task page, where you note down all thing things you need to do during the month. If you want even more space to write what you are doing each day of the month, include a daily spread or daily log as well. Begin the next blank page by writing a date at the top, then begin to write down all of the things you need to get done on that day. 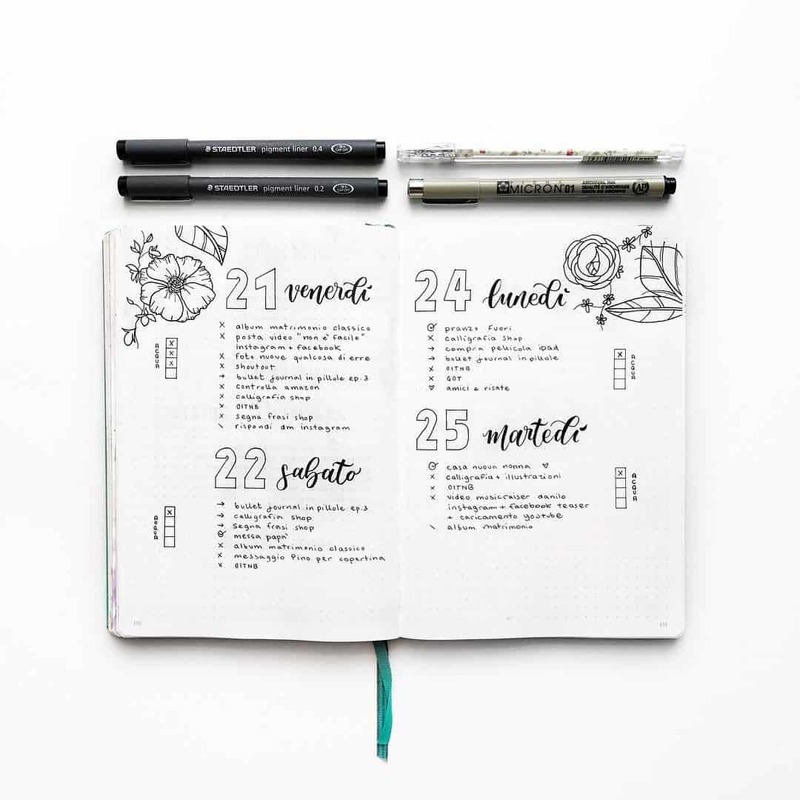 The key to using your bullet journal “properly” is that you create these daily logs the day before you need them, because you won’t know how much space you need to dedicate to each log until you know exactly what you need to do tomorrow! 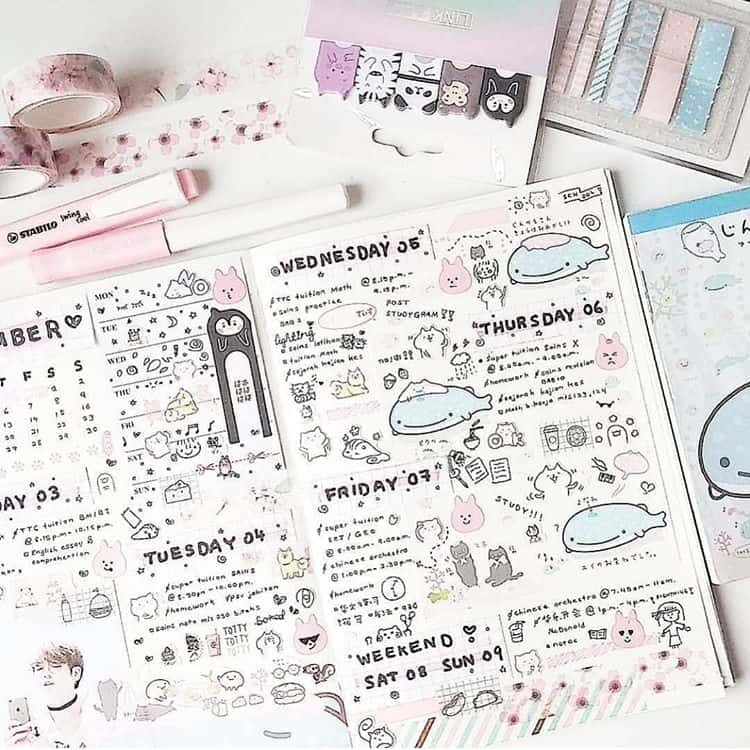 One aspect of bullet journaling is the flexibility of keeping track of your responsibilities or tasks and notes in different specific manners or ways. One of the many ways people organize their information that they keep in a bullet journal is by creating and using collections. Normally you would make a collection in a bullet journal when you find a reoccurring theme or task that you routinely log in your bullet journal. Think of a collection like a list, which can be a list of any information, tasks, events, ideas, favorites, or goals you might have. For example, if you realize you are always writing “take your vitamin pills,” in your Daily Log in your bullet journal, you might want to consider creating a habit tracker collection. This makes keeping track of repetitive things much cleaner and take up less space in your bullet journal. Collections can be lots of fun but can get out of hand quickly. Just think of all the things you can categorize! On second thought, don’t! To start with just brainstorm just a few things you’d like to keep track of and stick with those. Habit Tracker – Monitor your daily habits, such as how often you exercise, whether you are getting enough sleep, etc. Time Tracker – Track your time in one or many areas to determine how much time you spend on a particular activity. Goals Overview – This is where you have a list of all your goals, so you can see them in one place. Brain Dump – In this space, write whatever comes to mind on any subject. Gratitude Section – Here you can take time on a daily or weekly basis to recall the things you are thankful for. Journal Entries – Use this space like a diary to write your thoughts about what took place throughout the day. For the final section of this guide, you are going to learn some additional tips, tricks, and hacks for bullet journaling. Those new to bullet journaling often find all the examples of nice fonts and complex designs overwhelming. Keep it simple at first and just focus on the basics. Once you master those, you can then start to experiment with design. Remember the goal is not artistic ability but functionality. Will it help you plan your life and meet your goals? All you need to get started is a notebook, a pen and possibly colored highlighters, a ruler and a stencil. At this point, don’t get sidetracked trying to find the perfect notebook; any notebook will do. You may even have a couple of unused or half-used journals lying around. Those are perfect for your first Bullet Journal. Once you have your notebook and pen, you are ready to get started, but where do you begin? The best place to start is at the beginning of the journal, which will include standard pages like the index, a calendar and the future log so you can find them easily. For now, just label the pages even if you don’t yet have anything to put on them. You can always go back later. The great thing about the bullet journal is that you can start wherever you are, with whatever you want. After your initial pages are set up, there’s no rule for what goes on the next page. You might want to start with a daily page to plan out your day, a page of collections of books you want to read or a monthly page to plan out your month. Just don’t forget to return to the index and fill in the page number and topic as you fill your pages! One of the most helpful things about the Bullet Journal system is that you don’t have to wait until the beginning of the year to start one. If it’s June when you’re reading this just go ahead and start your Bullet Journal with June. Maybe you’re even starting in the middle of June, and that’s ok too. When you are getting started try not to spend too long looking at other people’s journals because they will likely make you feel inadequate with all their gorgeous, elaborate designs. Sure, you do need some guidance and inspiration to get started (it’s why we share so many bullet journaling ideas here), but remember to focus on the basics until you feel more comfortable. If you try to mimic everything you see other people doing, you will likely get frustrated. Yes, everything can be included in a bullet journal, but not everything that included in others’ journals has to go in yours. Give yourself time to figure out what’s important to you. Having said that bullet journaling is not as much fun if you don’t allow yourself to be just a little bit creative with it so go ahead and treat yourself to some colored markers or crayons, even gel pens can be fun. If you can’t draw or your handwriting isn’t as neat as you’d like it to be you can use stencils to enhance your design skills. Purchasing fun supplies can help motivate you to use the journal on a regular basis. Another interesting possibility for bringing a creative vibe to your bullet journal involves printing out various spreads and gluing them into your journal. As long as you’re not gluing in items on every page, a few key items added in sparingly shouldn’t disrupt the thickness or cover of your bullet journal. Keeping a bullet journal can get time-consuming with all the calendars, bullets, and special pages. It can certainly eat up your time if you let it get out of hand, but it doesn’t have to. 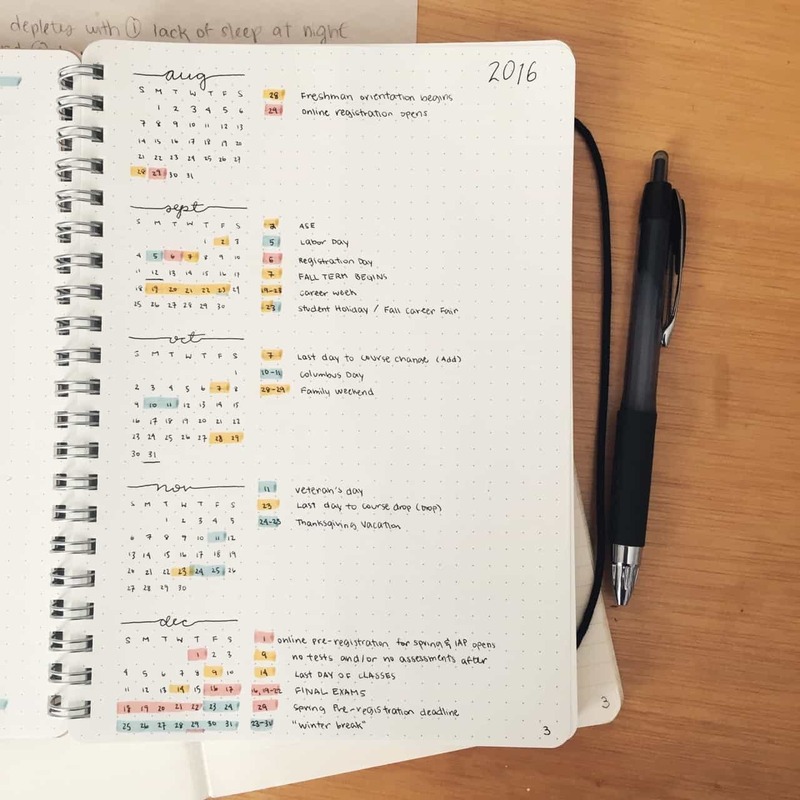 You should schedule time for bullet journaling just like you do with anything else. It’s up to you to find and make the most of your time. A good habit to get you in the groove is to spend time with your bullet journal each night. Thirty minutes to an hour should be enough time. Review Your Day – Evaluate your day, mark tasks completed or move them to the next day, make notes about whether you completed goals, write a diary entry, etc. Prepare for the Next Day – Brainstorm how you want the next day to look. What do you want to accomplish? Set up the next day’s daily page in whatever format you choose. Refer to your main event calendar to see whether you have any appointments scheduled to record for that day. If you have any unfinished tasks, go ahead and write them down as new tasks for the next day, and add any new tasks. Refer to Your Journal in the Morning – This will refresh your memory on what you must do that day. There are substantial benefits in taking time to plan for the next day. Putting your thoughts down on paper helps clear your mind and allows you to sleep more peacefully. In the morning, you will save time figuring out what to do first because you can simply refer to your Bullet Journal. Your day will go more smoothly, and you will be more efficient. If you have weekly, monthly, and yearly pages, you’ll want to plan time for those as well. For example, you may want to plan for the following week on Sunday evening, plan the following month on the last night of the previous month and plan the following year a few days before the end of the current year. 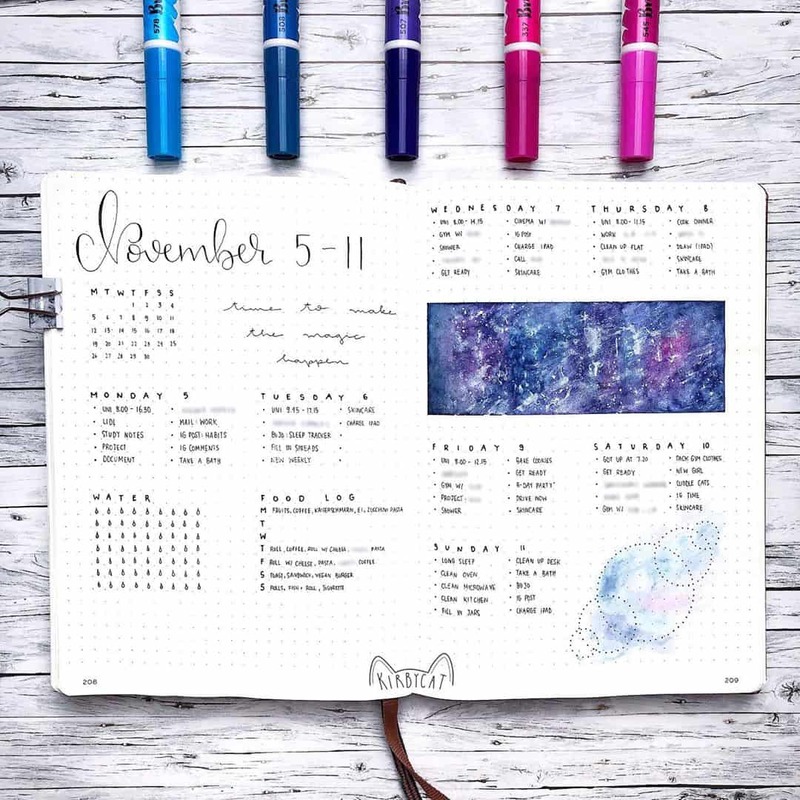 Since the bullet journal began, people have dreamed up numerous ways to use it. Always keep the important thing in mind: you can spend hours drooling over everyone else’s logs and spreads with all the pretty art and colors, but at the end of the day your bullet journal system must be one that works for you as a way to organize your life. Otherwise, you’ll just be left with a book filled with pretty art and no substance. Your bullet journal doesn’t have to be an art project. It doesn’t have to win any beauty contests. You don’t even have to share it on Instagram if you don’t want to! The best thing about the bullet journal is its flexibility and the freedom it allows. Every page doesn’t have to look the same. You don’t have to organize any of your content. One page can be a list of tasks for the day and the next page might be a list of movies you just thought of that you’d like to watch. There’s no right or wrong way to use your bullet journal. It belongs to you, and you are free to fill it however you wish. Now is the perfect time to get started on your bullet journal if you want to finally organize your life, keep up with tasks and to-do lists, and have one handy place for all the most important things in your life.